Little, Brown and Company, 9780316434775, 288pp. Zulema Renee Summerfield's short fiction has appeared in The Threepenny Review, Guernica, and elsewhere. Her first book, Everything Faces All Ways At Once, is available from Fourteen Hills Press. A MacDowell Colony fellow, she currently lives in Portland, Oregon. "Every Other Weekend comes as close to any novel I've read to capturing post-divorce depletion, and she does so from a child's perspective, which is exactly as gut-wrenching as it sounds. Almost nothing is as sad to witness as a child burnt out by life--and it is this sensation that lends Summerfield's impressive debut its weight.... Every Other Weekend manages to be both funny and fierce as it reminds the reader, through Nenny's charming narration, that children are always paying attention." "You are about to meet your new favorite author. Zulema Renee Summerfield knows just where the fault lines lie in homes and hearts and families and in EVERY OTHER WEEKEND she leads us to those with a magical compassion. Summerfield's voice is hilarious and scathing and healing. We find ourselves here, inhabitable. In EVERY OTHER WEEKEND, Summerfield brings us home." 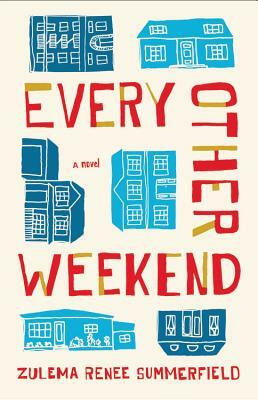 "EVERY OTHER WEEKEND is a sensitive, funny, pitch-perfect tribute to the 80s and that era's loss of innocence, one that speaks with wisdom to the tender complexities of families spliced together in the wake of divorce. By the end of Zulema Renee Summerfield's accomplished debut, every character felt like family--or perhaps they just rem inded me of my own." "Let this smart, sparkling debut take you back to the '80s and the land of broken homes... A fascinating look at what being a family is really all about." "Summerfield captures childhood with incredible tenderness, and this book is absolutely heart-wrenching."